His burger obsessions have frequently been played for comic relief and his baseball love has been well-documented here on GFS, but today my partner in crime, my husband Dan Cichalski, gets to tell his side of the story for a change. When something works, why change it? That may not be the official business model of one of my favorite hometown eateries, but it applies nonetheless. There are a dozen or so restaurants I can recall frequenting while growing up, among them Perkins (if not before it was a chain, then before all the franchises changed to the uniform green-and-yellow color scheme), Friendly’s, The Ground Round, Brothers’ Pizza in Red Bank (I called it the “Monster Restaurant” because it was so dark inside and had little lamp-like votives on the tables), Briody’s in Rumson. Yet they’re all either gone from the locations we visited or significantly changed from what I remember. All except for Edie’s Luncheonette in Little Silver, NJ. According to the restaurant’s own history, the 160-year-old building in my small hometown has been serving breakfast and lunch for about 43 years, first as Dennis’ Luncheonette in 1967, then the Sundown Sub and Coffee Shop in 1970 and, since 1973, as Edie’s, as it is generally known. What’s more remarkable, however, is that since Edith and John Bacigalupi opened the diner as Edie’s in 1973, it is now on its third set of owners, yet any noticeable changes have been minimal and mainly related to upkeep (perhaps some new tables and chairs) or progress (a new soda machine behind the counter). You can still walk in and get a hot breakfast, a toasted sandwich or a grilled burger. And no matter when you go, one item on the menu is always a must for me: Edie’s seasoned fries. Sure, they may simply be waffle-cut seasoned french fries, much like those offered by other places, but I’ve yet to try any that taste better. I couldn’t count how many times I’ve had breakfast or lunch there—it’s a short walk down the street from my parents’ house—because each visit is similar to the last. I’ve gone with my parents and sister, with my friends and with family in town on the day after Thanksgiving. 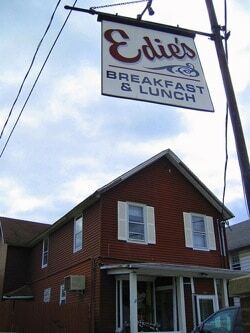 Though I may have grown up, in my memories of Edie’s, I’m usually somewhere between 6 and 16, eagerly anticipating that plate of fries. Casey and I drove down to Little Silver recently to have lunch at Edie’s and see if it remained as I remembered. As best I can recall, I hadn’t been there since before the current ownership took over in 2006. As far as I’m concerned, it could’ve been five, 10, 15 years ago, so little has changed. At lunch on a Friday, we didn’t have anything close to the crowds I was used to seeing at breakfast the day after Thanksgiving or just about any weekend, so we picked two seats at the counter where we could look up at the extensive menu board on the wall above us. Neither of us really needed the reference, however: Casey went with a tuna melt and I got a cheeseburger—and Edie’s seasoned fries for both of us. It’s not an indictment of the place to say that the food isn’t why you go. Though the grub is better than your standard New Jersey diner fare, Edie’s to me is more a place to catch up with friends, to get a plate of your chosen comfort food on a cold winter morning as you chase away the cobwebs from the night before. As we sat eating our lunches, I recounted my memories of unexpectedly running into friends while waiting for a table, of hearing how Bruce Springsteen allegedly once stopped in, and of ordering cold cereal because I loved the tiny boxes—miniature versions of what you see in the supermarket. I also looked at the black-and-white photos of old Little Silver on the walls and gazed over my shoulder at the Coca-Cola machine and cabinets behind the counter in the back. It’s the same spot as the 30-year-old photo of my sister, Jessica, and me, taken in the winter of 1980-81. That picture was probably snapped on one particular morning when a blizzard had closed the schools and our parents, both teachers, bundled us up and pulled us up the block on one of our two Radio Flyer sleds to get breakfast. 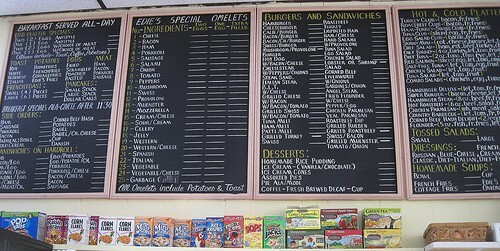 As with just about everything else at Edie’s, little has changed from what is shown in the photo. The tiles on the wall below the countertop look the same, the cabinet—though now empty—remains. 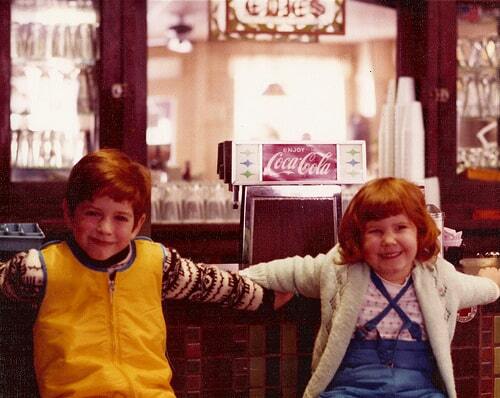 The Coke machine may be a newer model, but if Jess and I wanted to, we could meet at Edie’s sometime this winter and stand for a modern version of that same photo. While she and I may have grown up and moved to different parts of the Garden State, at least we know that when we go home again, some things have stayed the same.